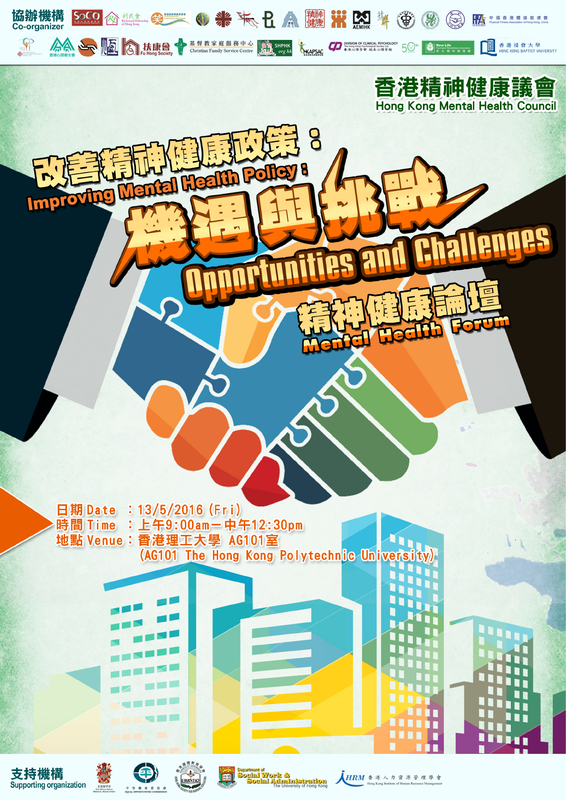 The purpose of this seminar is to enhance the mutual professional supports among cross sectors and related stakeholders to work hand-in-hand with Hong Kong Government to improve mental health policy since the Review Committee on Mental Health has been established by Hong Kong Government in 2014. It is confirmed that Professor Sophia Chan, JP, Under Secretary for Food and Health, and Mr. Chris Sun, JP, Head of Health Care Planning and Development Office, Food and Health Bureau, are to represent Hong Kong SAR Government as the officiating guests to participate in the Mental Health Forum. Professor Malcolm Hopwood, President of The Royal Australian and New Zealand College of Psychiatrist has kindly agreed to participate as a keynote speaker in the forum. Professor Hau Kit Tai; Honorary Clinical Professor Chen Char Nie; Professor Hector Tsang and Professor Samson Tse and Conveners or members of Specialized Committees, HKMHC will have sharing on the sight of “Opportunities and Challenges” from the models and perspectives of Australia and New Zealand for improving Hong Kong mental health policy in the panel and open discussion.